3001: The Final Odyssey is ultimately a flawed book, written to end a series which has sadly become increasingly redundant. Sad? Yes, because Arthur C. Clarke was a phenomenally good scientist with a lively imagination and the ability to craft very readable novels.3001 is the 4th and final volume in Arthur C. Clarke’s “Odyssey” series, starting with “2001”. The other 2 books are “201o - Odyssey 2” and “2061 - Odyssey 3”. I have to admit to not having read the middle 2 books, but since Arthur C. Clarke himself regarded this group of novels as not a linear series, or even sequential in the traditional sense, this did not seem to matter. The author tells us we should view the book as having some of the same characters and situations, with “variations on the same theme…. but not necessarily happening in the same universe.” Hmm.The starting point for this series was a short story by Arthur C. Clarke, “The Sentinel” written for the BBC in 1948 (and, interestingly, rejected by them.) Later on of course, with encouragement by Stanley Kubrick, this was hugely expanded and developed into the screenplay for “2001 A Space Odyssey”, a cult film of 1968 and still to my mind one of the most esoteric SF films ever made. Arthur C. Clarke points out that the whole project for this was still prior to the moon landings. We did not even know what the lunar landscape looked like at that point. (In the film “2001” the rocks on the moon’s surface appear a bit more jagged, but other than that it's a good approximation to say it’s all conjecture. )Surely this one point illustrates the impossibility of the task which Arthur C. Clarke ended up setting himself. Each novel became scientifically and politically redundant shortly after it was written. A classic dilemma of much SF, of course, particularly that which deals with Earth-bound concepts of the near future. The novel we are looking at now, 3001: The Final Odyssey was written in 1997 (and reviewed here in 2013). How can there be any consistency in the characters and situations when real-life events have overtaken them in so many ways? Arthur C. Clarke would never compromise on the scientific elements, and it is well documented that many of his ideas have actually come to pass. But obviously not all!Having said that, this is worth a look, if only to see what the black monolith was all about. In this book, the astronaut Frank Poole did not die, but was in suspended animation for 1000 years. (Cue scope for a nice meaty tale of Earth and humankind’s possible future.) Oh, and something very strange has happened to Jupiter. Other than that my lips are sealed. It's both amusing and sad when a book series falls flat on its face during its final leaps. The Odyssey series is, unfortunately, one of these. Except instead of attempting to get back up and trying to pretend its fall never happened, 3001 wallows in the failure, following the same idea as 2061; nothing happens. Well, nothing substantial, anyway.Let me be the first to say that I don't mind that Frank comes back to life. It was a (sort of) logical way to show Dave's human side (sort of) while still having a (sort of) familiar character to 'relate' to (sort of).The problem is that the entire plot is, as stated above, filled with 'sort of's. I honestly never found Frank engaging enough to care about, as he's pretty accepting about the fact that he's one thousand years ahead of his time and has very little difficulty adapting. I'll take the excuse that 'it's the future' for why he could miraculously be retrieved from space and brought back to life. There's been more implausible things in this series. However, what little personality he had in 2001 must have never been revived, because he is easily the most boring character in the series.Not that the characters have ever been the high point of the Odyssey series, with the exception of maybe Hal and Dave. It's always been about the adventure, the journey to get to the plot. The characters were always basically two-dimensional, and that was fine because it wasn't a character driven story. 3001 attempts to change up the formula, happily turning in its space suit for a more boring 'life-in-the-future' story. It's unfortunate that Odyssey ends on such a low point, when the first two were so good and the third passable. It won't go without recommendation - it's still a rather unique take on the future and one of the grandaddies of sci-fi. The good also far outweighs the bad in the series, with space descriptions that make you believe you were standing right there next to them.So if you haven't yet, check out these books, watch the movies, something. Odyssey is something that everyone - young and old - should experience. They told me - don't bother reading 3001, it's not worth it. I knew they were right. But partially from a need to complete the series, and partially out of morbid curiosity, I read it anyway. It's awful. It's only saving grace is being just 112 pages. There are a few beautiful passages - all lifted directly from the other novels in the series. He makes some interesting social commentary, but that's overwhelmed by his diatribes against religion. Again, instead of ending it just frays away. What plot there is ends, but it's an unsatisfying end. I will say this much for it - he does a nice job of handling a man sent 1000 years in the future. It's not an easy task, and he did it well. I also enjoyed the references to other SF works, and possibly seeing the origin on things in more recent SF stories. Did this inspire John Scalzi's "Brain Pal" in his Old Man's War series? To save you the trouble, here's my synopsis of 3001: The Final OdysseySPOILERS AFTER THIS POINT!!! (which I'm only hiding out of politeness. I'd much rather tell you about this book than have you suffer through reading it. )So, it's the year 3001. In an amazing coincidence, a ship finds the body of Frank Poole, the astronaut HAL knocked into space in 2001. Becuase of the advances in medical science, he can be brought back to life. Can we say Mary Sue boys and girls? I knew you could. And why write a knew character, when you can just bring one back from the dead. But I digress. He gets used to living 1000 in the future, and the author gets to hold forth on what's wrong with humanity in the second millinium. For poorly explained reasons, Frank decided to try and contact Dave Bowman, by landing on Europa. In this process he meets a philosopher who holds forth at lenght about the insanity of religion. Somehow this is related to landing on Europa, although I do not at all understand how. The landing works! Frank is now the only being in conact with the only being who can contact the Monolith. Whee. Frank goes back home, and goes on with his life. At some point, Dave gets in touch with him, basically pointing out that, based on 20th century information about humanity, the makers of the monolith have decided that Humanity has gone completely wrong and should be wiped out. Frank passes along that information, and watches as the great minds of the day figure out a way to stop their destruction. They gather the worst computer viruses they can find, send Frank back to Europa, and as him to ask Dave to be the Trojan Horse who delivers the computer viruses. They also give him a memory device to download himself to, to try and save him from the same fate as the monoliths. It works, humanity is just barely saved from destruction, but Dave's consciousness is still infected with the viruses he delivered and so cannot be contacted. Frank goes on with his life, missing his old friend. No, really. That's how it ends. In 2061, the Dave/Hal/Monolith entity thing downloaded a copy of Heywood Floyd. There's no hint of him in this book - nothing. ARG! I jos jedna knjiga koju mi je tesko oceniti. Sa jedne strane imamo odlican opis moguce buducnosti (vrlo pozitivna buducnost) prikazane kroz oci nekoga ko dolazi iz naseg vremena. Ideje i nivo detalja u tom delu su odlicni iprosto raspiruju mastu.Ali u druom delu knjige dobija se utisak da gosn Klark nije imao cistu viziju sta je uopste hteo da kaze sa knjigom pa citava prica ima nekako nedoreceni osecaj. Plus di je nestao Hejvud Flojd?Ipak knjiga daje dosta odgovora ne mnoga pitanja iz prethodnih delova u nekom smislu kraj je takav da je na citaocu da razmisli sta je moguce, mada licno nisam fan takvih krajeva.Ipak sve u svemu bilo je zabavno iskustvo sa puno maste tako da, po meni, citav serijal je i te kako vredan citanja. Of the two astronauts awake on the spaceship Discovery when the super-computer HAL went nuts, Frank Poole certainly drew the short straw. While Dave Bowman ended up an immortal extraterrestrial hybrid with the powers of a god, poor Poole ended up left for dead and floating off into the cold vacuum of space.Left for dead, but not - as we discover at the start of the fourth and final Space Odyssey story - actually dead. His body frozen into an effective state of hibernation, Poole floats unconscious around the galaxy for a thousand years before being picked up and successfully resuscitated.What must it feel like to fall asleep and wake up a millennium into the future? The first part of this book answers that with a mixture of culture-shock, humor and awe.As always, Clarke's extrapolations come from the latest scientific ideas of the time. Poole finds himself in city tens of thousands of miles above the equator, gets fitted with his own personal computer called a Braincap, watches asteroids being hurled at Venus in order to cool the planet down and meets genetically engineered dinosaurs that make ideal babysitters! When the story itself kicks in somewhere past the midway point, however, it proves to be thinner than the atmosphere of Mercury, nor does the ending qualify as a satisfactory conclusion to the writer's signature work.Still, the first half is fun, and the brief prologue which gives a quick account of the evolution of the Monoliths, entitled 'The Firstborn', is a stark and beautiful piece of writing that you wouldn't commonly associate with Clarke. Copy pasting from previous books instead of writing new descriptions, progressing the story only on the last 30-40 pages and closing this awesome series with a bland ending. Needless to say, it was a kind of a let down, unlike the first and second books which were AMAZING. I seriously hope that Clarke doesn't do the same "mistakes" in his other books because I seriously enjoy his writing style and subjects.I'm giving it 3 stars instead of 2 because of Clarke's presentation of future humanity, and because of some interesting notes written by the author. The late Arthur C. Clarke is one of my favorite science fiction writers and 2001: A Space Odyssey, based on an earlier short story of his, The Sentinel (1948), has always been something of a spiritual experience for me, even though I am not prone to spiritual experiences. But, given the prescient depiction of the moon and our galaxy in those pre-Apollo mission days, both film and book are breathtaking. For this current generation reared on CGI animation and blockbuster special effects and IMAX, it’s hard to articulate the feeling of this Clarke/Kubrick classic as it moved across the big screen. There was a certain indescribable feeling – a breathless, “whoa” at the end of the film as the screen went dark and the theatre lights came on. No one in the auditorium moved to peel ourselves off the uncomfortable seats. It was a hot summer day and the air conditioning had died halfway through the movie…yet nothing mattered.This was my experience in 1977, nine years after the film’s release, and I had already seen both Star Wars and Close Encounters of the Third Kind, which were special effects wonders in comparison. There was just this weird feeling that something happened. The 11 year old that I used to be had just had the second of only two real theophanies I would ever have…the first one occurred when I was six years old.Unfortunately, the lingering eager naiveté that accompanied my pleasure over 2001 and even 2010 (I was a high school senior when both the novel and the movie were released) could help 3001 measure up to the first two. But, then at 44 I am a bit more jaded then when I was a geeky and easily awestruck teenage science fiction nerd. My expectations were perhaps unrealistic. Nostalgia can break your heart.3001 is still compelling. The breadth of Clarke’s imagination has never failed to astound me as he takes current scientific knowledge and extrapolates the future world and fate of humanity. Just as in Kubrick’s film 2001: A Space Odyssey, which was broken into four components (the symbolism of 4 appeared throughout the film), Clarke has broken up his literary odyssey into four distinct novels that are not typically linear storytelling.As the final story opens we are a thousand years into the future from where the failed Discovery mission ended with Frank Poole being ejected from the spacecraft by Hal and the transformation of Dave Bowman into the star child. Heywood Floyd, Dr. Chandra and the Russian crew of the Leonov are also long gone. The earth and our small galaxy are different places…almost unrecognizable. Jupiter has been transformed into Lucifer, a dimmer version of our own sun, and it shines down on the evolving Europa. It is this future time that the 100 year old body of Frank Poole is found floating out in the outer reaches of the galaxy…frozen, but apparently not dead. He is miraculously revived and comes full circle in an odyssey of his own as he resumes his life in a world and time far removed from the early 21st century. As Frank adjusts to his life in this new world it would seem that the monolith is become active again. Soon Halman – the merged consciousness of Dave Bowman and the computer HAL – is being spotted again in various places. Soon he has an ominous message for his old friend Frank Poole.Clarke manages to tell a great story and retain an element of mystery about the powers or intelligences behind the monoliths, although I think he does a much better job of this in his Rama series, which are both technically and artfully his more superior works. But, those of you who share my sense of wonder over the world of the monoliths, Dave Bowman and Hal will still find something worthwhile in 3001 The Final Odyssey. 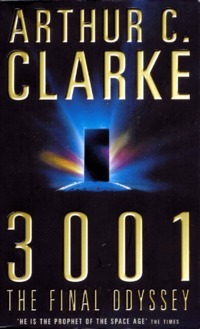 My 1998 review:"3001" has accumulated mixed reviews, perhaps because it's not really a novel: think "Looking Backward" or "Ralph 124C41+". Thankfully, it's better-written than those, but Dr. Clarke won't be remembered as a prose stylist.The plot outline is familiar by now - Frank Poole is revived after a thousand years as a cryo-corpse - flung into space in 2001 by the malevolent HAL. He marvels at the Wonders of the World of 3001, and gets reaquainted with Dave Bowman - and HAL - within the great Europa monolith. The Dream Team then saves humanity from the latest Monolith Crisis. Huh.The wonders of 3001 are genuine, and rigorously extrapolated. Four great towers support a Star City ring around the world. Civilisation runs by tapping limitless energy from the vacuum. Spacecraft and Star City elevators operate on inertialess drives... - all carefully footnoted and put into historic context: Buckminster Fuller designed an orbital world-ring in 1951. The first material strong enough to build a Space Elevator is the buckytube, discovered in 1991, and so noted by the discoverer, Nobelist R. Smalley. Richard Feynman [allegedly] once remarked that the vacuum-energy contained in a coffee-cup could boil off the world's oceans. There are tantalizing hints that inertia and gravitation could be electromagnetic phenomena, linked thru the Zero Point field... Literature citations extend up to late 1996. The end-notes alone are worth the price of admission.Sir Arthur himself has historic context - he wrote "The Sentinel" in 1948, just 3 years after publishing the theory of communication satellites. Clarke and Kubrick started working on "2001" in 1964, using "The Sentinel" as a starting-point. Clarke's reputation is such that, if our civilisation is still extant in 3001, people will be reading his predictions with interest and (no doubt) amusement. He was a living monument of the early Space Age. No one who is seriously interested in the future of science and humanity should miss this book.______________ insofar as *any* 1000-yr extrapolation can be "rigorous". Playing with the net up is what I mean. ‫با اون وضعی که کتاب سوم تموم شد،‌ انتظار داشتم این کتاب بلافاصله در ادامهٔ اون باشه. ولی داستان کتاب چهارم، ده قرن بعد از کتاب سومه و حتا به وقایع اون کتاب وفادار هم نیست. برای مثال در انتهای کتاب سوم خوندیم که لوسیفر خاموش می‌شه، ولی در این کتاب همچنان داره به ستارگی خودش ادامه می‌ده. نمی‌تونم بگم اگه کتاب رو نمي‌خوندم بهتر بود،‌ولی واقعاُ از کلارک انتظار بیش‌تری داشتم.‫البته در این کتاب هم به قدر کافی عناصر فلسفی و تفکرزا وجود داشت که شاید کسی فکر کنه این نمرهٔ پایین در شأنش نیست، ولی از اون‌جایی که روایت داستان برای من از هرچیزی مهم‌تره، تصمیم گرفتم به خاطر اون نکات هوشمندانه‌ای که در باب حریم شخصی می‌گه، نمره رو بالاتر نبرم و به همین سه ستاره کفایت کنم. Storyline: 2/5Characters: 3/5Writing Style: 3/5World: 3/5This was a coda more than a concluding volume. Arthur C. Clarke was 80 years old when this was published. Throughout the reading I felt like I was listening to a speech from an aged yet highly decorated senior citizen. He would muse, he would ponder, he would pontificate on things the newer generation were already engaging with at much higher levels and newer tools. You indulge the author though because he's earned respect throughout his long life. This latest delivery showed that he still had control of realistic, down-to-earth characters. He retained ownership of his original ideas and could still generate that spark of wonder which made his earlier works so beloved. In between the old-man-tries-to-keep-up-with-the-times future speculations, he would sometimes again lay out technological visions over which to marvel.Those hoping for grand endings are going to be disappointed. Clarke didn't aim to dazzle here; he was happy to let the Space Odyssey go out in gentle reverie. This was Arthur C. Clarke's memorial to Hal, Frank Poole, David Bowman, and 1:4:9. 3001: The Final Odyssey brings Arthur C. Clarke's famed series to a merciful end, closing out what was perhaps a misguided effort from the beginning, or at least from 14 years after the first book, when a sequel was written.Trouble began brewing in the Odyssey series with the release of 2010: Odyssey Two, in which Clarke decided to abandon all differences between the previous book and the movie version, and act as though only the movie events had occurred. As someone who greatly preferred the book, this disturbed me, in much the same way that George Lucas' constant tinkering with the Star Wars universe irks those fans. The third book brought further unexplained changes, and 3001 continues this tradition; including its protagonist, Frank Poole, having been born in 1996--he went on the Jupiter mission at 5 years old?? Regardless, the story within the novel is the important thing, yes?For this final outing, having exhausted the surviving cast of 2001, Clarke manages to bring back the dead one, Frank Poole, who had been drifting through the solar system for an entire millennium. He is found floating around and is revived...somehow, it's not explained very well. Now he is a man out of time and must adjust to the human experience of the future, as well as tying up loose ends with those pesky black monoliths. Apparently that experience involves technology and physics; lots of it!Every chapter, and indeed the entire book, seems to end more quickly than it should, so that you never get a sense of what it's like to live in this world of the future, except that you'll probably be doing it in a giant space elevator tower, or maybe on a moon somewhere. Frank will occasionally have academic discussions about the past thousand years, including plenty about how everyone decided to abandon every religion and become agnostics, or...something, this is also not explained very well (Clarke seems to be particularly annoyed with the Catholic institution, harping on the Middle Ages repeatedly). Even with Frank as our eyes and ears into this world, you don't get much of a sense for what he actually does with himself, when he's not flying spaceships and investigating monoliths. Whole decades, near as I can figure, are skipped over with barely a sentence to explain the transition in plot. Indeed, the most interesting passages come from text which was lifted verbatim from the previous novels.It does have some great scientific ideas being narrated, such as the four massive towers (it was six in Odyssey Three) built along the equator of Earth, leading up to the "sky city" ring in geostationary orbit. Or the palm-implanted data exchange system which tells everyone you meet about yourself (Palmbook?). There are many interesting little tidbits like that in the novel, and perhaps that is the reason for its existence: to inspire technological advances and furtherance of creative ideas in SF literature. Perhaps it succeeds in that manner.On the whole, though, this seems like more of an exercise in narrating interesting scientific papers, than in providing a compelling story. Even the ultimate conclusion of matters with the big questions of the series are fairly disappointing, and seem like they're quite different from what they may have been if Clarke had written this sooner than three decades after the original novel. The plot is very dry and sterile, with little emotion or the sense of wonder and discovery that the first two books managed to imbue. It is a conclusion that is running on the fumes of past glory. Mercifully short, it is worth a library rental, if you've read this far into the saga, but I'd stop short of a purchase. It's a thousand years since Frank Poole's death at the metaphorical hands of HAL and humanity has entered a new golden age. A spaceship finds Poole floating deep in the solar system and with the help of 3001 technology he is revived. Poole's second life allows him to see what humanity has become and soon realizes he might be may still be able to once again meet fellow astronaut Dave Bowman, or the thing he has become anyway. Straight away I'm afraid I must point out this last Odyssey book is the worst of the bunch. I wouldn't say it is bad a such but it lack the drama of the previous books. For a start there is very little space travel here, which is what the Odyssey books are all about. Frank explores the future of humanity and this is the best thing about the book. Clarke's vision of the year 3001 is original, intriguing and believable. It almost feels like Clarke has been to the 3001 himself. Much more could have been made of Frank feeling a man out of his time though, but unfortunately the Frank has as much character as one of the series' infamous monoliths. It feels like Clarke got 3/4 of the way through the book and realized that though he had shared some interesting ideas nothing had really happened yet. So he decides to make the humans find a way to destroy the solar system's main monolith on Europa. There is no real sense of struggle though and the solution is identical to a popular sci-fi film of the 90s. Clarke's joint work with Stephen Baxter in the Time Odyssey series shows what this part of the book should have been like.As with all of Clarke's work it has some great ideas and it does tie up the series successfully but given the quality of the first four books, this final one is quite the let down. I have quite enjoyed reading Arthur C Clarke's four-parter, but one of Clarke's tricks does not hold up well to a marathon run through the series. I noticed that every book takes large sections of text from earlier books, pasting them in as flashbacks that are word for word reproductions of what he said the first time. If there were supposed to be subtle changes from one book to the next, I didn't see any. I've only seen David Bowman's flythrough of Jupiter and visit to the oceans of Europa about 4 times now. Other than that annoying trick, I have enjoyed the books, though 3001 is probably the weakest of the lot. Especially since it seems to forget 'Big Brother's' use of wormhole technology in 2001 ... unless that was all a hallucination within the Monolith. Well, that was something. 3001 held a sense of excitement since I started reading the series. It's a shame that I have to say, I was mostly let down. Right off the bat, I didn't like the route taken to introduce the main character for this final "odyssey". Besides that, my main complaints are that it was just too slow and disjointed throughout.During the first half, I kept thinking "what is the point here?". Clarke's vision of the distant future was intriguing, but the story lacked any sort of hook for WAY too long! Once that hook came (around 60% through), I got excited, only to be let down by the fizzle of a climax that lasted all of 2 pages. I was left wanting so much more.Yes, it did explain most of the mysteries that had been created throughout the series. However, it could have gone a lot farther, particularly pertaining to the creators of the monolith. I wanted to know what their reaction was to the events of the climax! It looks like I will never know.As my friend had suggested in his review, I would only recommend this book if you absolutely love the series, even then, go in with low expectations. It is noteworthy to consider how Arthur Clarke opened the third book, and what the ramifications to the entire series were. With wanting pragmatism, he wrote that: "Just as 2010: Odyssey Two was not a direct sequel to 2001: A Space Odyssey, so this book is not a linear sequel to 2010. They must all be considered as variations on the same theme, involving many of the same characters and situations, but not necessarily happening in the same universe.Developments since Stanley Kubrick suggested in 1964 (five years before men landed on the Moon!) that we should attempt 'the proverbial good science-fiction movie' make total consistency impossible, as the later stories incorporate discoveries and events that had not even taken place when the earlier books were written. 2010 was made possible by the brilliantly successful 1979 Voyager flybys of Jupiter, and I had not intended to return to that territory until the results of the even more ambitious Galileo Mission were in. "Deriving not only from what Clarke tried to project as a caveat but as well as from general systemic observations from the series, I find the pressing need to elaborate on the following points. Clarke cautions his readers not to treat the apparently labeled series as well, a series of books characterized with continuity and relativity. This is clear when he phrased that 'it' was not a direct sequel and must be considered as variations of the same theme. For the reader however this is rather demanding if not theoretically impossible considering the method, characters and story arcs Clarke choose to write with. Putatively and substantially seen in this simple manner:Book One: Dave Bowman mysteriously disappears while in transit on his missionBook Two: Dave Bowman returns as a part of the Monoliths and another mission is launched in pursuit of ascertaining what had happened, Dr. Floyd Heywood becomes one of the major personas by this pointBook Three: Floyd Heywood returns in the scene of another space explorationBook Four: Frank Poole re-emerges as what could be labeled as the single persona in the fourth book establishing a connection with the series. For one who has read the series, the meager attempt to express the thought in the words above should suffice. After all the recurring references while reading the books there is hardly any need for me to elaborate on this. Arguendo however, if we find the utter need to satisfy some inner justice and lend credence to Clarke's desire to treat the succeeding books not as sequels but stand-alones (and i believe this is what he meant when he said that they were "to be considered as variations of the same theme"), the books, with intrepid audacity, fall into a position that is not only demeriting but which I fear could unfortunately be an unprecedented fatal waterloo for the whole of Space Odyssey books. I qoute myself by saying that:"The book did not feel a book at all while reading it (something i've started to feel in the first book already), but more something like of a novella, or a piece greater book that is the series. I'm starting to get the impression that the 4 books should have been published as one judging by what the content has encompassed so far"Nothing has proven to be quite substantial in the series to merit a change in this perspective. In the contrary, I find that the deeper I was into it, the further my pretense was affirmed, conclusively in varying instances. I too find it rather irritating, as short as the books already were, that Clarke included a chapter or three from the previous books, lifting them by the whole, which presumably he wanted to function as ardent nostalgic chapters reminding the reader of events that have passed. I find them nothing but repetitive vestiges that can choke the living hell out of the reader (to be fair that was an exaggeration). It was redundant, draggy, convenient and a poor excuse for an imagined attack of writer's block (and this is what i've honestly felt). To be critical however, Space odyssey is still a page-turner as it is (whether of excitement with the next chapter or with boredom with the lifted ones). Arthur Clarke writes in a gripping manner that catches you until the last of the pages. I give credit to his imagination contained in the writing. For me they were fresh, novel and exciting. The mystery of the monoliths can keep the reader enthralled as far as the story goes, the very idea of the monoliths was exciting in itself. The biggest letdown of this series/variations on the same theme however lies in the revelation that it failed to deliver (sole reason why the fourth book was rated two stars). After all that excitement, I opened the pandora's box only to see, nothing. Read it yourself and then try to tell me it deserves more stars. I simply cannot connect this work with the absolute genius Clarke displayed with "Childhood's End" or the first 1968 Odyssey novel. Here's the synopsis:1. Discovery astronaut Frank Poole is found floating in space in the year 3001. He is reanimated, and tries to adjust to life in the 31st century.2. Frank get's bored and hitches a ride to a colony on Jupiter's moon, Ganymede.3. Meanwhile, for the past 100 years, the hybrid plant/animal creature has been busy evolving on water moon, Europa, under the watchful eye of the giant monolith. We are told that this big Europa monolith is actually controlled by another big monolith in a star system about 500 light years away.4. A localized software/computerized representation of Dave Bowman in the Europa monolith tells Frank that orders recently arrived from the monolith 500 light years away and that they probably are orders to exterminate the human race. The guess is the images and data from 20th century were apparently received 500 years ago and they were interpreted as all bad by the decision-making computers with the monolith world. Sorry, but this is where the novel gets unforgivably stupid. I guess, to the alien mentalities involved, there was nothing hopeful or good about what came out of the 20th century.5. Anyway Frank ask Dave to introduce a computer virus into the Europa monolith before it can start wiping out the human race, and he agrees. It works. Humans are saved, etc. etc. Arthur C. Clarke - Arthur C. Clarke was one of the most important and influential figures in 20th century science fiction. He spent the first half of his life in England, where he served in World War Two as a radar operator, before emigrating to Ceylon in 1956. He is best known for the novel and movie 2001: A Space Odyssey, which he co-created with the assistance of Stanley Kubrick.Clarke was a graduate of King's College, London where he obtained First Class Honours in Physics and Mathematics. He is past Chairman of the British Interplanetary Society, a member of the Academy of Astronautics, the Royal Astronomical Society, and many other scientific organizations.Author of over fifty books, his numerous awards include the 1961 Kalinga Prize, the AAAS-Westinghouse science writing prize, the Bradford Washburn Award, and the John W. Campbell Award for his novel Rendezvous With Rama. Clarke also won the Nebula Award of the Science Fiction Writers of America in 1972, 1974 and 1979, the Hugo Award of the World Science Fiction Convention in 1974 and 1980, and in 1986 became Grand Master of the Science Fiction Writers of America. He was awarded the CBE in 1989.